d i v e r s i t y w o m a n . c o m Fa l l 2 0 1 7 D I V E R S I T Y W O M A N 37 By Ruchika Tulshyan I t took Leen Kawas, the 32-year-old CEO of M3 Biotechnology, plenty of fortitude to raise her first million dol- lars for her biotechnology start-up. "I kept getting told that as a woman, and espe- cially because I was young, being the CEO of my own company was 'high risk,'" she says. Undeterred after being turned down by multiple investors, Kawas kept knock- ing on doors to grow her R&D-intensive start-up. Eventually, in a two-and-a-half year pe- riod, her company raised $14 million; the final $1 million "took one email and one week to close," she says proudly. Kawas is among a growing cohort of millennials who have a C-level job title. Sometimes stereotyped as being enti- tled and lazy, members of generation Y (because they follow generation X) have earned a bad reputation in corporate cul- ture. But as more millennials ascend the career ladder, their suc- cess not only can be seen as proof of what works in innovative organizations, but also offers learning opportunities for members of other generations. Make no mistake—millennials are tak- ing charge. Now that they've surpassed gen X as the largest generation in the US workforce—with 91 percent aspiring to leadership positions—we can expect that the millennial style of leadership is here to stay. Kawas says that her generation is more willing to handle rejection and show re- silience. For example, she cites her resolve to repeatedly fund-raise even in the face of barriers, including ones out of her control, such as racial and gender discrimination. Kawas equates risk- taking tolerance with age. 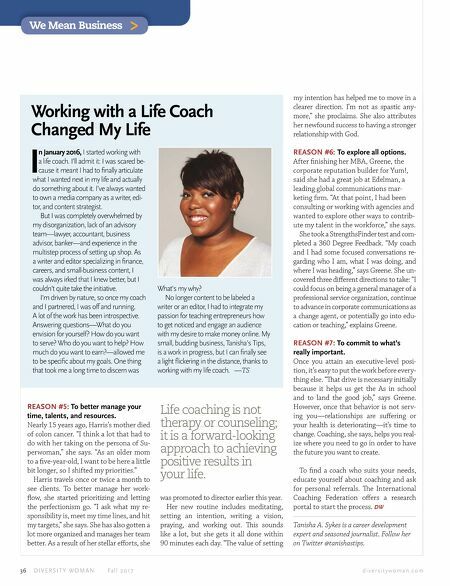 She eschewed a steady research job after getting her PhD, in favor of jumping headfirst into the un- certainty of start-up life. Kawas says it is precisely because she is young that she has been successful. "I like to take risks," she says. "It's an advantage to be a young busi- ness leader because you're not influenced by earlier experiences, so you're more like- ly to take risks." 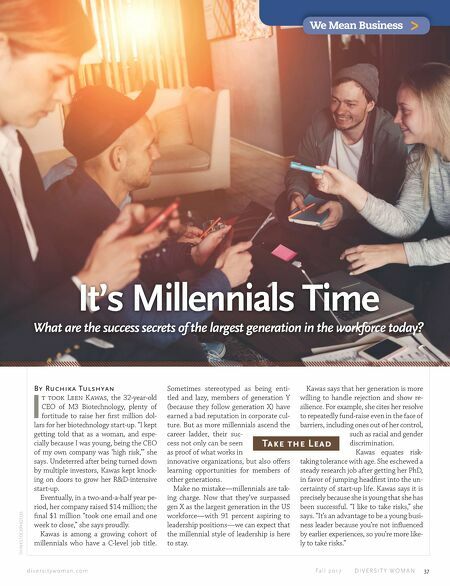 Take the Lead THINKSTOCKPHOTOS We Mean Business > It's Millennials Time What are the success secrets of the largest generation in the workforce today?